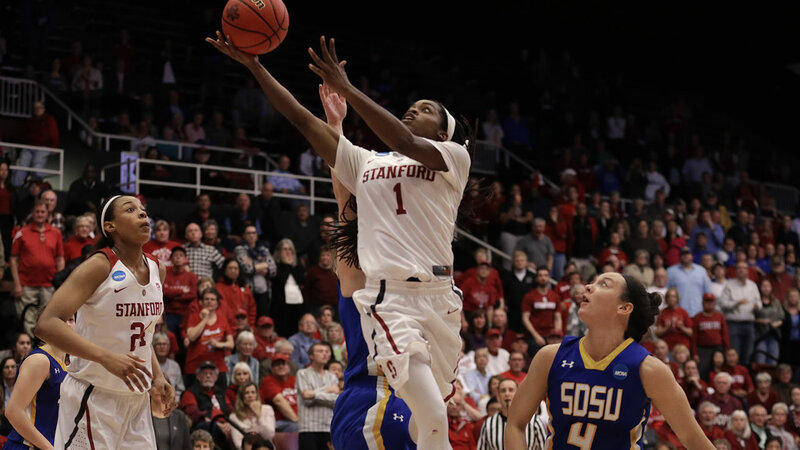 Stanford women advance to NCAA Sweet 16 with win over S. Dakota St.
STANFORD, Calif. -- Lili Thompson made a go-ahead three-point play with 8.2 seconds left and Erica McCall delivered a big block moments later, lifting No. 4 seed Stanford into its ninth straight Sweet 16 with a 66-65 comeback win against 12th-seeded South Dakota State on Monday night. Immediately after Thompson's missed 3, Miller couldn't convert the second of two free throws. VanDerveer called timeout before Thompson's winning play. The Cardinal overcame shooting 10 for 22 from the free-throw line, while the Jackrabbits were 6 of 16 after also struggling in their first-round upset of fifth-seeded Miami on Saturday. Gabby Boever was held to three points on 1-of-7 shooting in her final collegiate game, while Thompson had 14 points and Kerri Young 13. Stanford: VanDerveer, who coached her 1,203rd career game overall, WOULD be 21 victories from joining Pat Summitt as the only NCAA women's coaches with 1,000 career wins. ... The Cardinal improved to 34-4 in NCAA games on their home floor. ... The 65 NCAA women's games played at Maples are second most at any venue behind Tennessee's Thompson-Boling Arena (66).
.@UCLAWBB beats @USFWBB. That means four Pac-12 teams -- the Bruins, @StanfordWBB, @UW_WBB and @OregonStateWBB -- have advanced to Sweet 16.